Connecto is a tool to increase engagement and convertions on your site. This involves using popup widgets to drive user to certain goals and actions. What we have mentioned below are some best practices that we have learned over time from our users. As a site owner its possible to setup a widget to be extremely aggressive which can hurt user experience which not only hurts the website but also Connecto. With this blog its our aim to make you aware of these best practices for our customers as well as for all webmasters. At all times Connecto measures the close rate of each popup widget and informs you the same in our admin and daily report emails. The close rate of each notification is a reasonable indicator of user annoyance and hence should be taken with utmost seriousness. We will now go ever each factor that determines the impact on user behavior and the best practices related to them. The number one factor that determines user experience is the position and form factor of the widget. 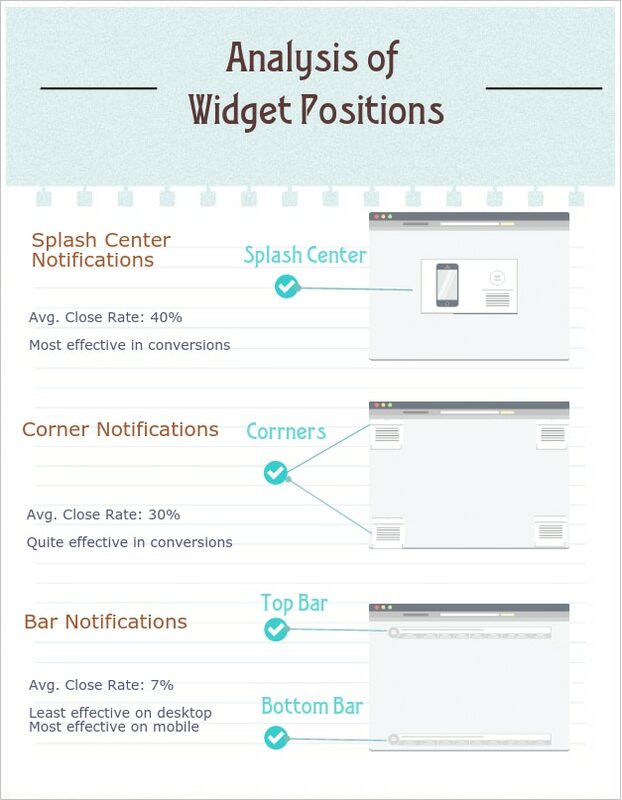 Splash center widgets, while most effective in getting user attention also tend to be the most hurtful in terms of UX. Typically, you can expect 3-4 times more conversions from a splash center widget compared to a bar but they also tend to get 40-50% close rates, simply because users must turn them away to continue consuming the content. On mobile Splash center widgets should be strictly avoided. Banners or widgets on the 4 corners of a webpage are comparatively more user friendly and tend to get 25-30% close rate. Top and bottom bars are the most polite modes of communication. Normally, they get slightly lesser conversion rates but we see hardly 6-7% close rates on the bars. On desktops these are less effective in terms of conversions from splash center widgets or corner widgets but on mobile they can be extremely effective. Connecto can also fill certain embedded slots on the your website dynamically akin to Google Adsense. So for example if you allocate an area on your right nav to Connecto, it can fill it up with an image/lead form or any form of notification with the same types of targeting as for the popups. So you don’t necessarily need to have popups and in this case the notification seamlessly fits into the page thus being more user friendly. The second most important factor deciding user experience is remembering their choices. Website visitors typically don’t mind being asked once for their email or a piece of information. However, they hate it when they reject it once, and are interrupted again on a new pageview. Worse, if they have already filled a form and you ask them again to fill that form. Its very important to remember what choices they have made at each point, even across seessions. Connecto remembers user choices for a configurable length of time by default. Minimizing a widget is great when you want to park yourself on the side for the user so maybe they can checkout a coupon code or fill a form whenever they are ready to do so. However for announcements its usually better to just let the user close the notification when they are done. Furthery, there are many ways within Connecto to make messaging more targeted so the user experience is not hurt. Autoclose: which closes a notification automatically after N seconds (only applicable for close and not for minimize). Using these measures you can have a tradeoff between UX and outreach. The key idea is to keep a watch on close rate. Always remember that your users love you and they would be happy to be in touch with, unless you get on their nerves. So remember these best practices and happy converting!